Want to make a difference in a mastectomy patient's life? 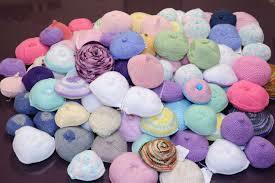 Make them some knitted knockers. We have the yarn here for you. Sirdar Cotton DK is 100% cotton, smooth and non-allergenic so it won't cause problems. 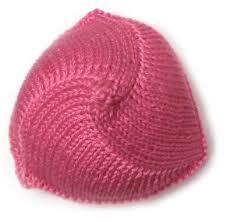 The website to get the pattern and to learn more is Knitted kockers Alberta. They have both knit and crochet patterns. 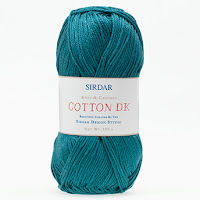 Please use the suggested yarns which are Cascade Pima (we don't carry this yarn), or we have received approval to suggest the Sirdar Cotton DK which we do have. Dishcloth cotton is NOT okay. It's for washing dishes, not for putting into your bra. Would you want dishcloth cotton in your bra? Well, unless you like to always be prepared to wash dishes. A $13 ball of Sirdar Cotton DK will make 2-5 knockers depending on the size you make. And all you need to do is knit them. They do the stuffing and finishing part and then they distribute them for free to women who need them. So come on down, purchase a ball or two, and knock yourself out! You can even bring your finished ones back to the shop. P.S. If you buy the suggested yarn we will give you the pattern for free! Normally we would charge for ink and paper. Or you can download the required pattern from the website. Front view. Like our new signage? Here we go! Pictures from the Calgary Show. The show was held at Spruce Meadows. What a gorgeous place! English heritage looking buildings all over the place. If my feet hadn't been sore at the end of the day I would have wondered around. As it was I took the wrong turn on the first day and had a nice little drive around. I guess I should have got pictures of that. Lori testing out the till. Anyway, we didn't have much competition as far as yarn stores go. 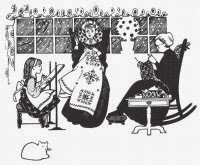 It's mostly quilting and scrapbooking - I have no idea what scrapbooking has to do with stitches but those scrapbookers are crazy. Dancing, singing, exercising. They are a noisy bunch. I'm sure if we got enough yarnies together we could beat them at it. We got to show off some new yarns. Lori's mom, Muriel,packed us a great lunch which we ate standing up and serving customers. 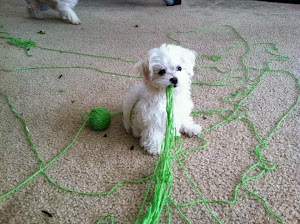 And Lori's arm knitting classes were a huge success! Next year I'll try to do better with the pictures. Maybe more of the venue. It's just that our booth looked so stunning! Posted by Anna Maria Junus (happy employee who got to go and boy did my feet hurt at the end of both days).